Fair use is the flexible and dynamic exception to copyright law that serves to balance the rights of creators with the public interest in using copyrighted works to advance education, to comment and criticize, and to make new creative content. Its flexibility is often somewhat intimidating or frightening because when considering fair use it is very rare to know with certainty that a use is fair, only that it is more or less likely to be fair. It can be frustrating that the law does not give us any clear answers regarding amounts we can use and know that we are "safe". Fortunately, there are ways of understanding the purpose and function of fair use that can help us feel more confident about evaluations and maybe even come to love fair use for its flexibility. 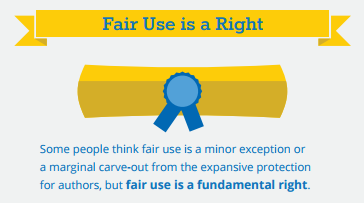 Fair use is determined by considering four factors of that use. No one factor is determinative; each factor must be considered and weighed. Usually after considering each of the four factors and weighing how much each fact of your particular situation favors or disfavors fair use, you are left with an overall sense that your use is "probably fair" or "probably not fair". Really, only the courts can offer us definitive answers. How do you propose to use the work? Purposes that favor fair use include education, scholarship, research, news reporting, criticism and commentary. Non-profit purposes also favor fair use. Commercial uses weigh against fair use. The biggest mistake we see educators making is mistaking their educational context for an educational purpose. If you create a class website or presentation and put a pretty picture on it primarily for decoration or visual interest, this is very different from an image about which you are providing direct instruction. Remembering copyright is designed to protect works of creative expression, the more highly creative the work you want to use is, the more fair use is weighed against. This is, of course, subjective. We might say, in general, a novel would be more highly creative than a work of non-fiction but, of course, there is a huge range of creativity within the huge category of "non-fiction". Unpublished works would also be less likely to qualify for a fair use than published works. This is the one where everyone seems to want to see some percentage or number of pages that will always be fair. There is no such number. The goal of fair use is to make available a wide and unpredictable set uses. Could a legislator predict in advance that a future satirist would never need more than ten percent of a work in order to make their point? Of course not. As a general principle: using less of a work is always more likely to be fair than using more. 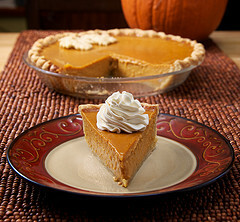 The smaller the portion used is relative to the whole, the more likely the use is to be fair. It is also true, however, that using an entire work can be and often is a fair use. Another guiding principle: using only the portion of a work that is absolutely necessary in order to meet the educational (or other fair) purpose you have in mind is more likely to be fair than using more than is necessary. For example, if you are considering copying a 4 page article for your class because the author makes an argument you'd like to discuss but that argument could be well understood by reading just a couple of paragraphs of the article, copying just those paragraphs would much more strongly favor fair use than copying the whole article. The more the portion you want to use represents the "heart of the work", the less likely your use is to be fair. This can be a very difficult one to assess. The most useful way to think about this factor is to ask if your use could substitute for the original in the marketplace. 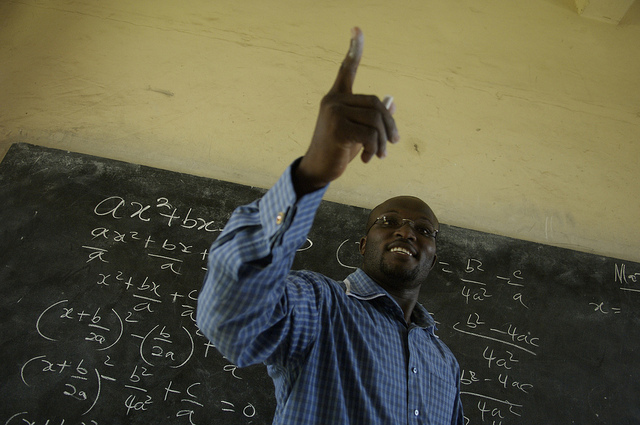 Would your use substitute for sales either to your students or to anyone else? A confusing piece here is the permissions market. A strong market exists in selling permissions to use content, especially things like book chapters and journal articles. So it can be easy to say "Oh, of course my student won't be subscribing to Professional Journal X so copying an article certainly doesn't substitute in the market". But it would substitute for that secondary permissions market. We don't at this time have truly conclusive case law to guide us in thinking about the permissions market but it does seem very likely that where there is a viable permissions market for the material you want to use, this would weigh against fair use. Once you have looked at all of the factors, you can assess if taken as a whole your use seems likely to be fair or likely to be unfair. No single factor is determinative and you could "strike out" in three categories but have the remaining category weigh so strongly in favor of fair use that, overall, your use is fair. We discuss this in more depth below in "Thinking about Fair Use: Transformativeness". It is important to remember that using a checklist will never let you determine with certainty whether or not a use is fair. It can, however, help you organize and, importantly, document your thinking. It's a great idea to use and print a fair use checklist whenever you are dealing with a tricky fair use situation. Take the time to document your thinking in case of a future challenge! This checklist allows you to check off the factors at play in your analysis, as well as add text that explains your thinking, and then emails you your results. This is a great thing to keep for your records. Columbia University provides excellent context for why and how to use a checklist and provides a checklist for your use. The Center for Media and Social Impact has worked with a wide variety of user communities to document the best practices for applying fair use in those communities. In 1994 the Supreme Court unanimously found that 2 Live Crew's song "Pretty Woman" did not infringe the copyright in Roy Orbison's song "Oh Pretty Woman" despite the fact that the parody song drew from the "heart" of the work of the original, used large amounts of a creative work, was a commercial use, and had negative effects on the market. It would seem in this case that all four factors would weigh against 2 Live Crew. The court found the use fair, however, because 2 Live Crew's use was transformative. This idea had been present in legal scholarship for some time but it was this case (Campbell v. Acuff-Rose Music) that cemented the concept. The Court finds that when source work is used in new and unexpected ways, the use is more likely to be fair. Some people view "transformativeness" as a kind of "fifth" fair use factor, other see it as a way of understanding the interplay between the four factors. In a sense, we can view "transformation" as the goal of fair use. Fair use exists in order to give citizens the ability to take existing creative works and use them to create new knowledge, understanding, art. We find, when evaluating fair use, it is helpful to keep "transformativeness" in mind as we look at the picture that our four-factor analysis gives us. "I'm sure I read somewhere that 10% of a work is always fair!" "Isn't it okay if I use something one term but then I have to get permission the next term?" We know from looking at the four factors of fair use that no specific amounts are dictated and there's nothing in there about 'spontaneity' or 'cumulative effect' (all that "one term free" business). So why do so many of us remembering hearing these things somewhere along the line? These concepts come out of the Classroom Guidelines. These are a set of negotiated guidelines agreed to by the Association of American Publishers and The Author's League of America following the passage of the 1976 copyright law (which first codified fair use). The Guidelines are an agreement between private parties intended to provide a kind of "safe harbor". That is, the publishers were essentially saying that the guidelines represent, in their opinion, an interpretation of the minimum standards of fair use that they could live with and if educators operated within that "safe harbor" they would not be liable for infringement. The guidelines specifically state that they are meant "to state the minimum and not the maximum standards of fair use under section 107". Despite this, many groups including the American Association of University Professors (AAUP) objected to the Guidelines as they feared they would come to be seen as, in essence, a ceiling rather than a floor. That is, to express the limits of fair use rather than the minimum. This fear has most certainly proven to be well-founded with many institutions enshrining the Guidelines as policy. Certainly the Guidelines are widely conflated with the actual law. The Guidelines can be helpful, especially when regarded as the "floor" they were intended to be. Remember that there is no real guarantee that the Guidelines do actually represent a "safe harbor" as they do not carry the force of law. But, more importantly, remember that the very nature of fair use is that does not attempt to anticipate all future potential uses and describe in advance if those uses are fair. 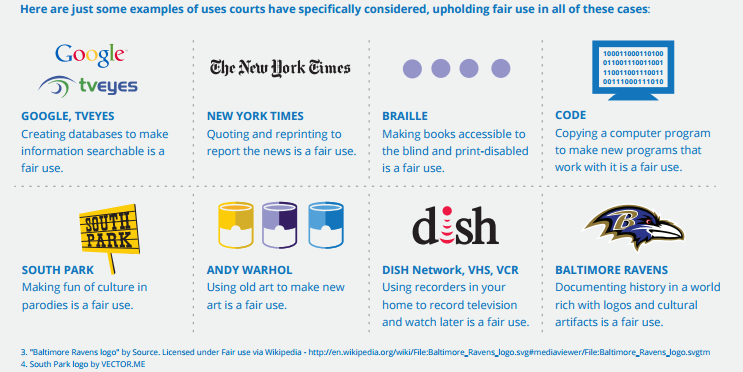 Infographic displaying important fair use concepts from the Association of Research Libraries.